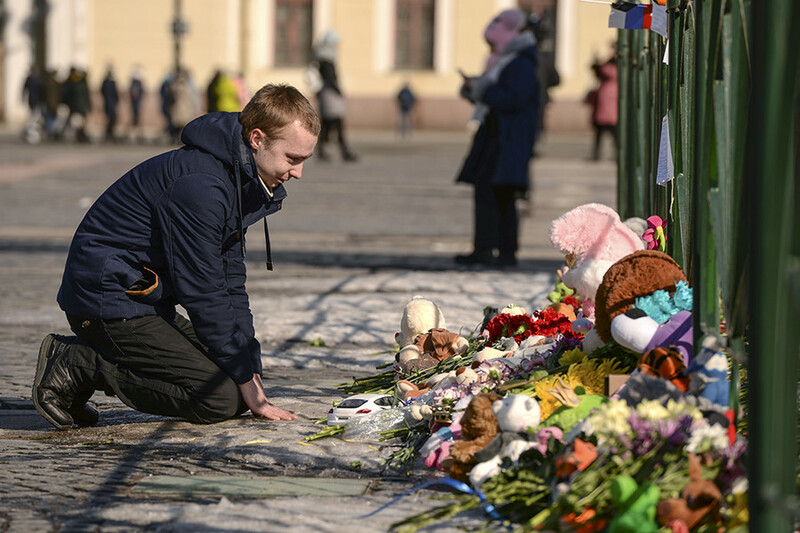 Russians are in mourning as rumors about the true death toll circulate – but the official number of victims remains unchanged as the investigation continues. 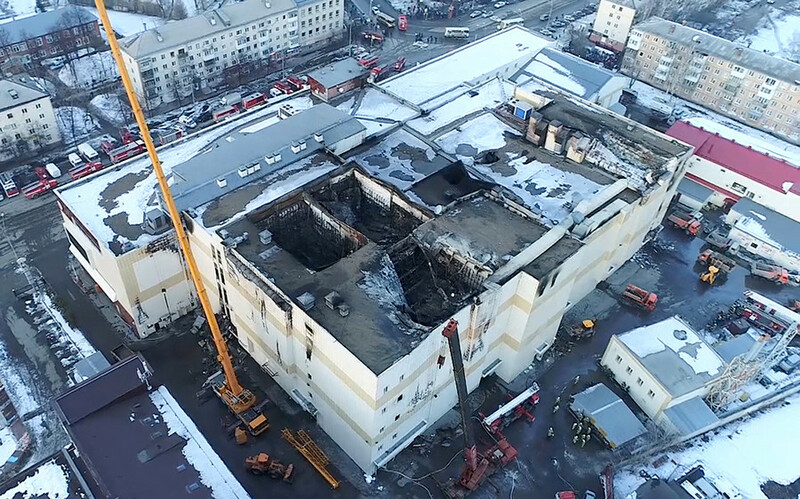 Igor Vostrikov from Kemerovo (a Siberian city located 3600 km from Moscow) became a living symbol of the tragedy that unfolded in his city – he lost his wife, three kids, and his sister in the fire which ripped through the Zimnyaa Vishnya (“Winter Cherry”) mall on March 25. Vostrikov’s loved ones were trapped behind closed doors in a cinema – they had no chance. “I have nothing to lose. My life is over,” he said. According to the official data, 64 people died in the fire, including 41 children. Now Kemerovo and Russia are looking for a way to live with it – and who is responsible. A man kneels near a spontaneous memorial on Dvortsovaya Square in St. Petersburg. March 28 was declared a national day of mourning but acts of solidarity with Kemerovo started earlier across the country. On March 27, in more than 30 cities from Kaliningrad to Vladivostok, people gathered to commemorate the victims. 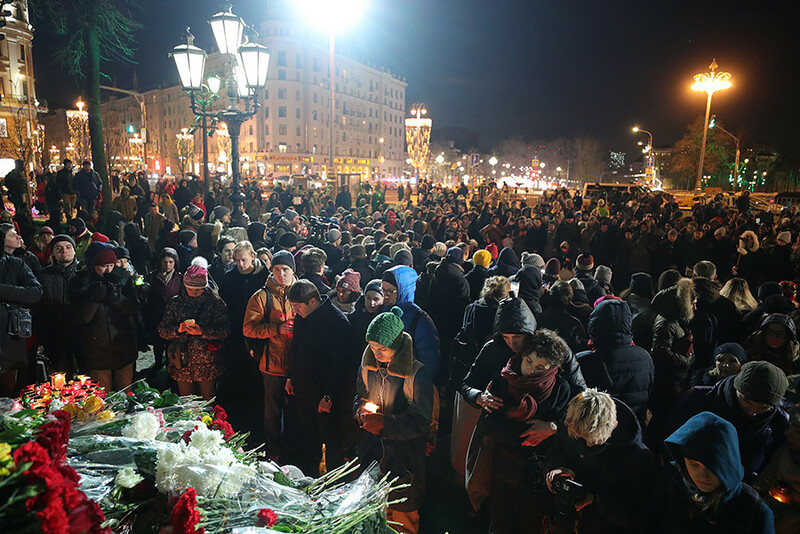 Around 12,000 came together in silence in Moscow’s Pushkin Square. “I couldn’t just stay at home and do nothing – I’ve seen the footage of children falling from shopping center’s windows. It was horrible,” a young boy called Alexander said. 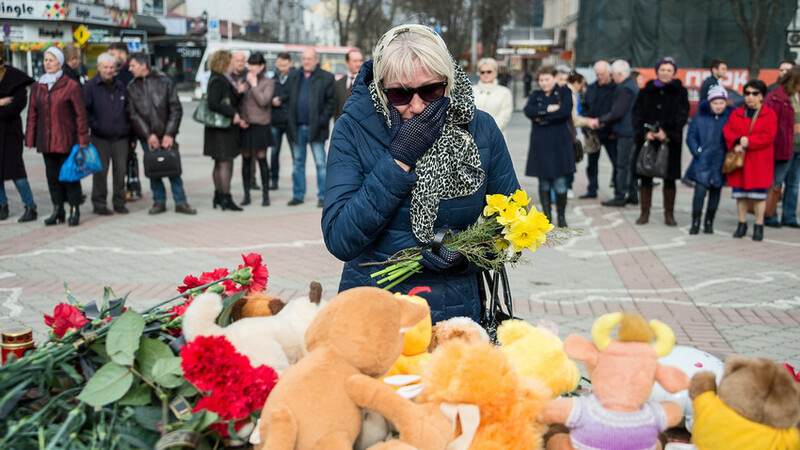 People attend an event in memory of the Kemerovo shopping mall fire victims in Pushkin Square. “It’s clear that you can’t change anything. It’s clear that no one here understands one-hundredth of the suffering that those who lost their children are going through. But we all are scared as well. I guess I’m here to help shoulder the burden and see that I’m not alone,” Yana, a teacher, told the media in St. Petersburg. The officials of Russia's Ministry of Emergency Situations during their work in the half-burnt Zimnyaa Vishnya mall. Meanwhile, President Vladimir Putin arrived in Kemerovo on March 27 along with the heads of the Investigative Committee (IC) and Russian Ministry of Emergency Situations. According to their reports, a short circuit was most likely to caused the blaze. 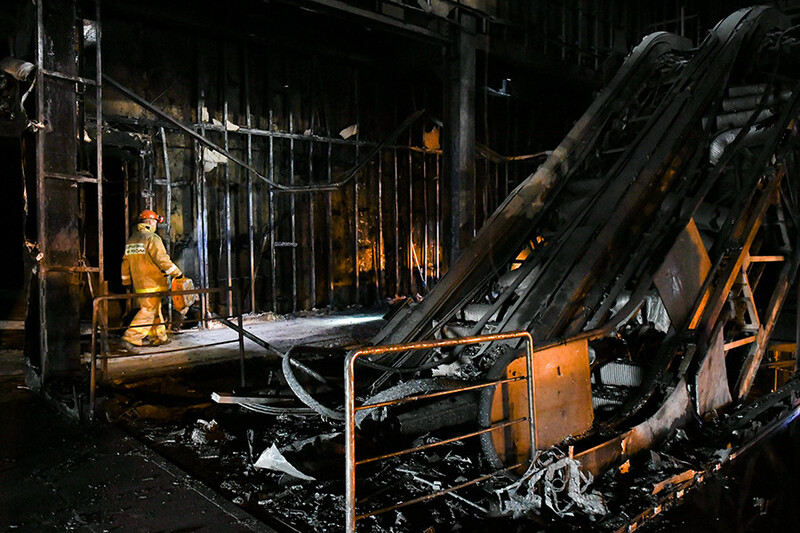 Nevertheless, on March 28 TASS reported that the fire may have actually started in the children’s play area in a dry pool filled with foam cubes. Alexander Bastrykin, the head of the IC, also noted that the alarm system in the shopping center had not worked since March 19 – and no one had done anything about it. After the fire started, the guard didn’t turn on the alarm system. “We don’t understand why – some unqualified man,” Bastrykin said (now the guard is arrested by the court). What’s more, the emergency exits were blocked so people couldn’t escape. “Presumably, the shopping center was rebuilt [several years ago] with many violations, including structural,” Bastrykin said. Putin, while talking to Kemerovo citizens, stated that a thorough investigation is being conducted and “all the culprits will be punished.” By March 28, the governor – Aman Tuleyev – had fired his vice governor and head of internal policy department. The Zimnyaa Vishnya mall after the blaze which killed 64 people. There are rumors that the actual death toll is far higher than the official figures – some people think as many as 335 bodies are being secretly held in morgues. However, many morgues have been checked and so far this is not the case. The Village media outlet also checked how many tickets had been sold for the cinema in the mall (most of the victims died in one of the cinemas) and confirmed that official numbers are likely to be true. As it later turned out, the rumors spread after a prank call to one morgue – the caller asked if there was enough space for 300 bodies. The Ukrainian prankster Evgeny Volnov confirmed it was he who called the morgue “to show Russians what they turned their state into.” But his joke backfired. “Hatred towards Ukrainians [in Russia] exists and spreads because of freaks like him,” Ukrainian journalist Anatoly Shary wrote on Twitter. The official information on the victims remains the same: 64 people dead (41 children). The Ministry of Emergency Situations reported on March 28 that all the bodies have been found. First funerals were already conducted. For more information on the tragedy, read our first material dedicated to the Kemerovo fire.